‘Ignoring Gravity‘ is a debut book by Sandra Danby published by Beulah Press. ‘Ignoring Gravity’ follows the story of Rose who is confident about her identity. She pulls the same face as her grandfather when she has to do something she doesn’t want to do, she knows her DNA is the same as his. Except it isn’t: because Rose is adopted and doesn’t know it. I absolutely loved this book. I am usually very wary about reading books by new authors, especially ones which I haven’t read any reviews on previously, however I was pleasantly surprised with Sandra’s book. From the very first page I was hooked. It started off exactly how you would expect it to – calm and simple – however, as the story unfolds we are introduced to a series of constant enigma’s. We mainly follow the journey of Rose and Lily, and whilst we are searching for their unanswered questions to be resolved, we also learn a lot about their current life relationships with both people and work. I disliked Lily’s husband from the very beginning and my hatred for him became more and more prominent as the book went on. Nick however, was a darling who I really loved – he was handsome, patient, loving and understanding. What more could you want in a man? Although the book is mainly centred around finding out who Rose’s mother and father are, Lily’s issues are also a central part of the story. The fact that Lily is having problems conceiving and is being neglected by her husband plays another equally important part of the story. I adore the way this book is written and especially the way in which it is sectioned. Rather than having specific chapters, each part is split up as either ‘Rose’ or ‘Lily’, or even sometimes another character such as ‘Nick’. These specific parts then focus it’s attention on that particular characters point of view which I found really interesting as it enabled me to jump inside their heads and understand them just that little bit more. I haven’t read a book similar to this before and it has really opened my eyes. Most books I read are usually chick lit, but this one has really made me want to search beyond that particular genre as my favourite. I estimated about a week to a week and a half for me to read this book as I wasn’t sure what to expect, but I actually finished it in just 3 days and had problems putting it down. All in all, I would absolutely recommend you going to buy this book. I am very thankful to Sandra for letting me read and review her book prior to publication and can most definitely tell you that this is not the last you will hear from her. I’m positive she is going to have a bright and promising future as an author! I am pleased to inform you that the e-book of ‘Ignoring Gravity’ is now on sale!! 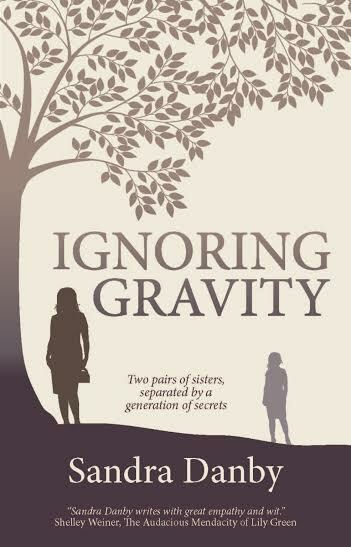 The paperback of ‘Ignoring Gravity‘ is to go on sale very soon (December 2014) and I would definitely recommend this book as a Christmas present for a loved one who loves a bit of suspense and enigma’s! Hope you all enjoy reading this review and be sure to let us know what you think!